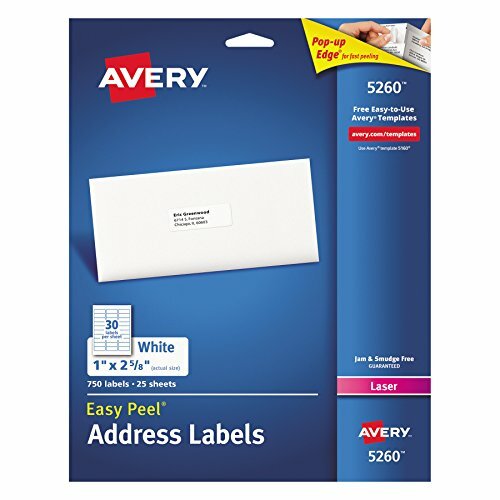 Avery Easy Peel White Rectangle Address Labels are great when you want to create professional labels quickly and easily. These rectangle label stickers are perfect for high-volume mailing projects, or to use for organizing, identification labels, bin labels, craft labels, gift tags, classroom organizing, product labeling, gifting, arts & craft projects and more. The patented Easy Peel feature makes applying the labels a breeze. Just bend the label sheet to expose the Pop-up Edge, peel off your label and fold the sheet back to flat to keep remaining labels secure. The white labels are optimized for inkjet printers, and are JAM-FREE and SMUDGE-FREE guaranteed. 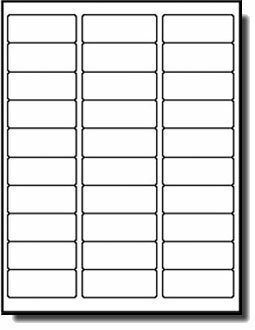 Rectangle address labels are easy to customize with free tools, software and templates from avery.com/templates. Each pack of label stickers includes 750 labels with permanent adhesive to help you tackle large projects and mailings. Labels 30 per sheet. Your mission: a high-volume mailing project. 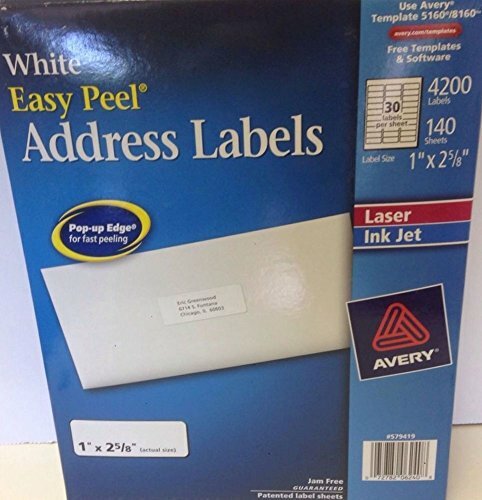 Your secret weapon: Easy Peel White Address Labels. Time is of the essence, so use the Pop-up Edge for fast peeling. Patented Easy Peel label sheets let you bend the sheet back to expose the label edge, peel, then fold the sheet back to flat in a jiffy. Start creating multiple labels in minutes using free templates and software from avery.com which allow you to import data from Excel, Outlook, and more. You'll get jam-free and smudge-free labels that look professional and polished every time. And just like that-mission accomplished. 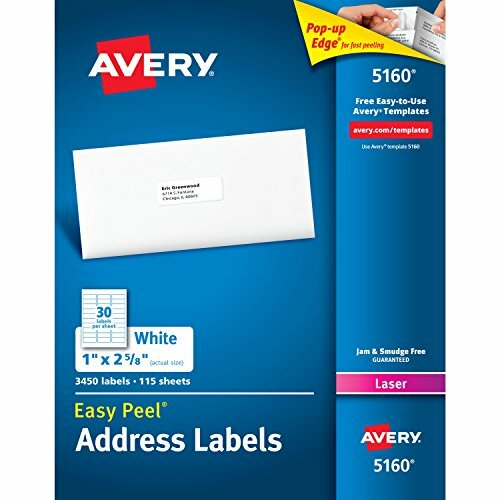 Avery Easy Peel Address Labels, Permanent Adhesive, 1"
Easy Peel White Address Labels are great when you want to create professional labels quickly and easily. They're perfect for high-volume mailing projects, or to use for organizing and identification. The patented Easy Peel feature makes applying the labels a breeze. Just bend the label sheet to expose the Pop-up Edge, peel off your label and fold the sheet back to flat. 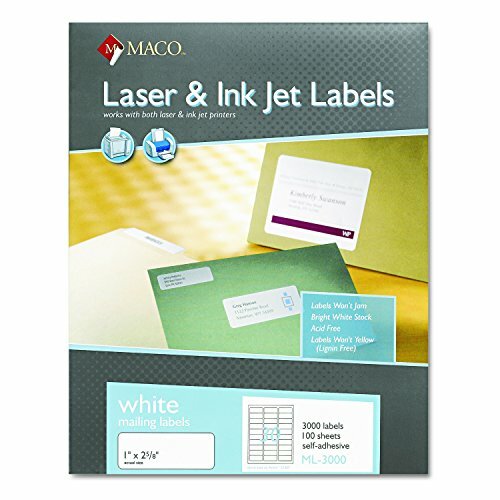 The labels are optimized for laser printers, and are jam-free and smudge-free guaranteed. 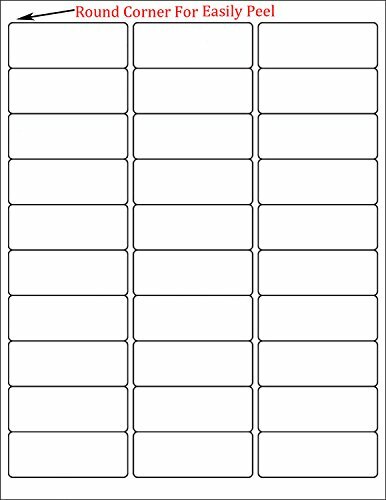 To easily customize your labels, simply use the free templates and designs at avery.com/templates. 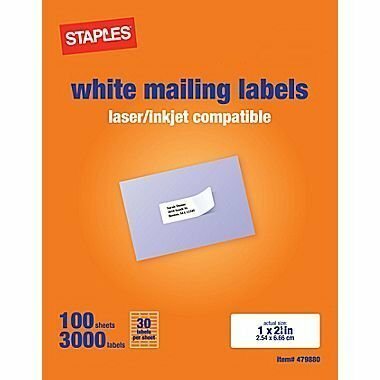 enKo [110 Sheets; 3300 Labels] 1 x 2-5/8"
MACO Laser/Ink Jet White Address Labels are designed for use with any desktop laser or ink jet printer. The bright white label stock is guaranteed not to jam and produces sharp text and rich colors. 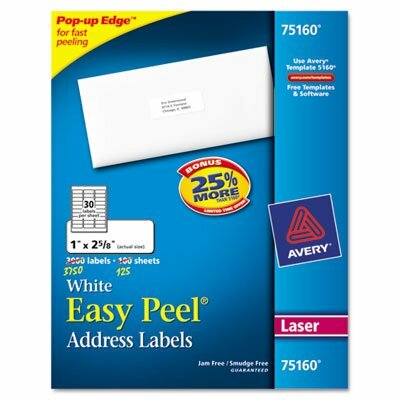 These permanent adhesive labels are ideal for bulk mailings, identification and organization. They are acid-free - safe for archiving and lignin-free - won't yellow over time. Label Size: 1 x 2-5/8 inches. 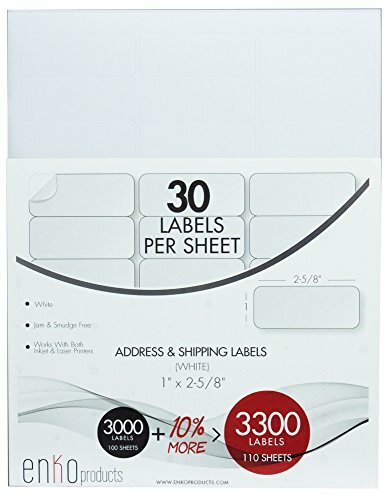 30 per sheet, 3000 labels per box. MACO has been providing quality products to the business community since 1916. Their office products truly offer a blank canvas for creative business solutions. 1. sheet size-- 8.5" x 11", label size-- 1" x 2.625". 2. The 30-UP shipping labels are 100% compatible with Laser/ Inkjet printers. 3. The half sheet thermal transfer mailing labels are very adhesive on boxes and envelopes. 4. MFLABEL Company is factory direct sell. Our labels are all with competitive price and premium quality. 5. We can accept custom all kinds of barcode shipping mailing labels. 6. If you have problem on the printer setup or label use, please contact us via Amazon message. We will give you a suggestion. 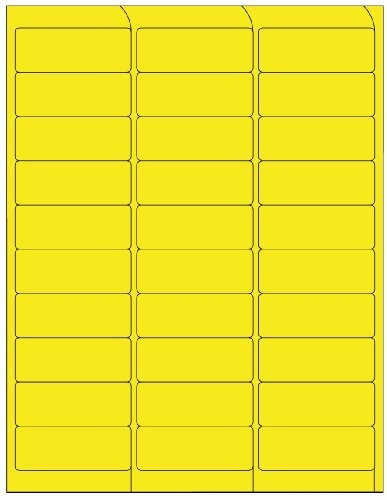 Highest quality Fluorescent yellow address label for laser printers, featuring exceptional print quality, strength, opacity and brightness. Labels will not jam or curl. High performance in over 99% of laser printers including HP, Canon and Dell. 3.4 mil face stock with permanent adhesive. Ideal for address, identification, barcode and warehouse labels. Extensive shelf life, one year, when stored at 72 degrees Fahrenheit and 50 percent relative humidity. Copyright © Wholesalion.com 2019 - The Best Prices On 5160 Laser Online.